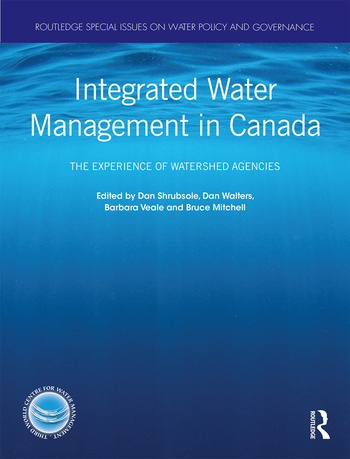 This volume provides readers with an opportunity to learn from front line water managers of watershed-based agencies across Canada about integrated water management (or integrated water resource management). In common with practice in much of the world, the responsibility for implementing integrated watershed management in Canada is fragmented. Each province and territory in Canada has developed unique approaches or governance models to guide decision making in that regard. Thus, this edited volume enables readers from around the world to gain insight on the best practices in Canada for achieving success and addressing barriers to implement IWM. Three types of integration are popular among the agencies included in the book: (i) among environment, economy and society, (ii) interactions between people and the environment and (iii) integration (or coordination) of administrative activities. The chapters were originally published in a special issue of the International Journal of Water Resources Development. Dan Shrubsole is a Professor in the Department of Geography at The University of Western Ontario in London, Ontario. His research focuses on water governance, with a particular interest on river basin planning and management, floodplain management, wetland management and diffuse source pollution control. He has conducted research primarily in Canada and Australia. He is a past board member of the Canadian Water Resources Association, and is currently President of the Canadian Association of Geographers. Dan Walters is an Associate Professor in the Department of Geography at Nipissing University, has been studying integrated watershed management in Ontario for fifteen years. His research activities include assessing First Nations water risks, source water protection strategies, wetland conservation, nutrient management, cyanobacteria management, and the conservation authorities program. Barbara Veale is Director of Planning and Watershed Management for the Halton Region Conservation Authority, a watershed management agency based in Burlington, Ontario. Barb has extensive experience in implementing integrated watershed management, co-authored reports and journal articles on the subject, and provided advice to fledgling watershed management groups in Canada and elsewhere. Barb’s doctoral research focused on watershed governance and explored the use of watershed report cards as decision tools for watershed management in Canada. Bruce Mitchell, FRSC, is a Distinguished Professor Emeritus in the Department of Geography and Environmental Management at the University of Waterloo. His research focuses on water policy and governance, with particular attention to implementation of integrated water management. He has conducted research in Canada, Australia, Britain, China, India, Indonesia and Nigeria. He is a Past President of the Canadian Water Resources Association, and an honorary professor at five Chinese universities.